35 This letter is written to one of God’s favorite children. I know how difficult it may be for you to appreciate those last words in view of the sufferings you endure; but they are true nevertheless. M an’s purpose in life is to serve God here on earth as a means of meriting the eternal reward of Heaven. Of course, the conditions under which we serve God depends upon the surroundings in which He has placed us. For some, those surroundings consist of power and wealth, and all the advantages which they carry with them. For others, it will mean commonplace circumstances of life with their mixture of pleasure and hardships. For still others, those surroundings will be a matter of constant suffering, in the sense that they are made up of those things from which the normal person ordinarily shrinks. You, dear friend, are in the latter class. The music of the theater, the laughter of the banquet table, the natural and normal consolations which come from human relationships - all of these are denied to you. No matter how helpful those around you may try to be, the inevitable fact confronts you that, during most of your life, you will have to put up with the four walls of your room and the somewhat impersonal companionships which your books and your radio furnish. How slowly the clock ticks under such circumstances and how agonizing are the hours which follow! Prolonged periods of social isolation can cause even the hardiest of individuals to break down. In spite of these hardships, you remain God’s favorite children chosen by Him and, in a very special way, are the recipient of His Love and affection. It is natural that you should feel low at times, particularly when special circumstances and your own weaknesses weigh heavily upon you. Helplessness, loneliness and the feeling of being a burden to others have a pain all of their own which no amount of reasoning or resolve can entirely remove. Your suffering would lose its pain if those situations were entirely removed, and it is the very fact of your suffering which has marked you as one of God’s favorite children. 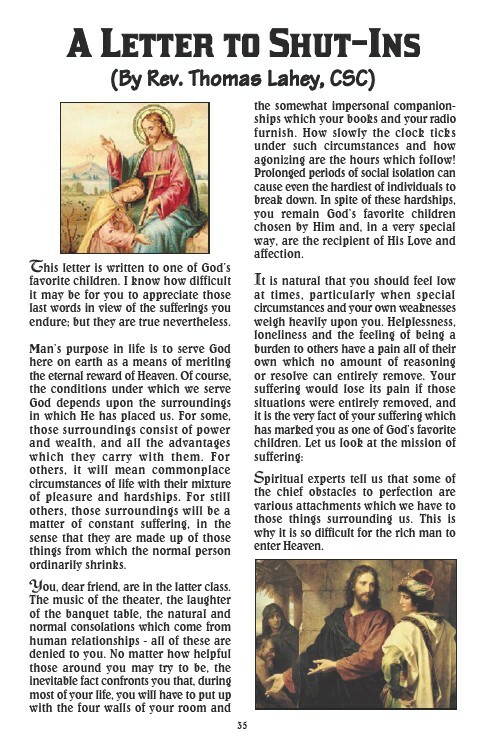 Let us look at the mission of suffering: Spiritual experts tell us that some of the chief obstacles to perfection are various attachments which we have to those things surrounding us. This is why it is so difficult for the rich man to enter Heaven.